Full time job, part time job, taking care of the dog, house work, meals, social life, PLANNING a wedding AND working out. Talk about a FULL plate. you can do anything you put your mind to!! 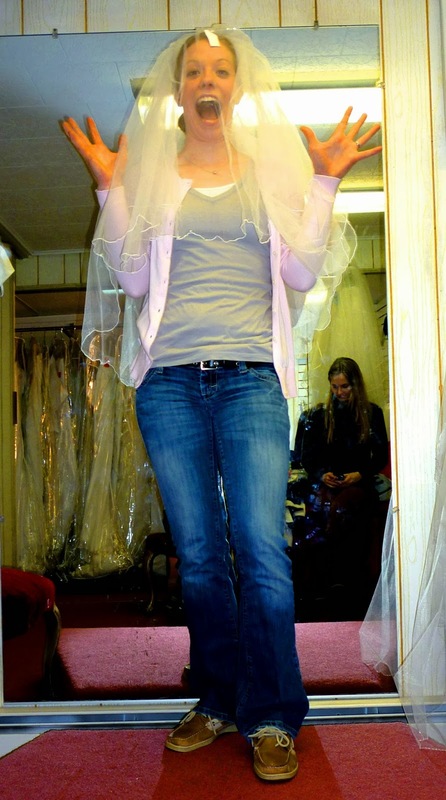 Over 8 months I lost 15 pounds and had to have my wedding dress taken in 1-2 sizes! DISCLAIMER: I am NOT a dietitian, qualified nutritionist or personal trainer. 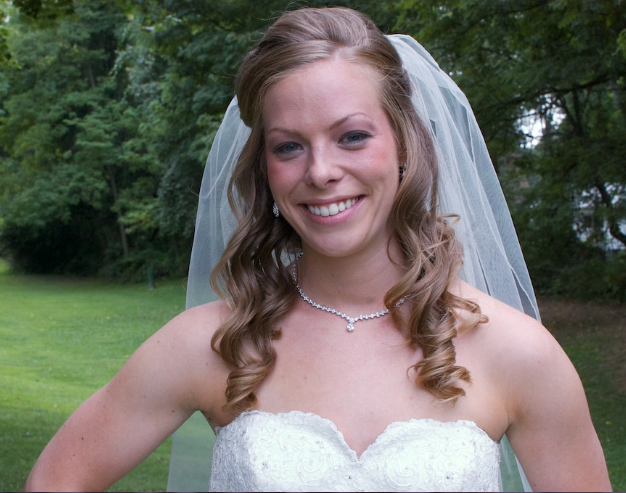 This is simply what I did to get into shape to look the best on my wedding day. A little bit about my fitness background. I swam competitively for 12 years on 3 teams; YMCA, High School and College. A lot of my ideas come from a swimming sets and dry land workouts. I swam breaststroke, butterfly and the Individual Medley. One of the reasons I loved the IM was because I got bored of the same stroke. So you will notice in my workout pattern, I mix it up. I find it boring to run 5 days a week. Some people love it, it's not for me. 10 months before my wedding I had to have a mole removed on my calf. This wouldn't have been bad, but it forced me to avoid the gym for 2 months. Every time you walk, your calf muscle bulges. The first time my stitches were removed the area opened up and I had to have a second set of stitches. The point of this rant is to let you know I had 8 months to get in shape, after doing nothing for 2 months (this was also during Thanksgiving pie and Christmas Cookie season). Please read this with an open mind. Feel free to change anything and adapt the workouts/plan to what is best for you. I believe it is way easier to get in shape so you can have fun on your wedding day; rather than to constantly be thinking *stick chin out* and *angle arm out* while pictures are being taken. 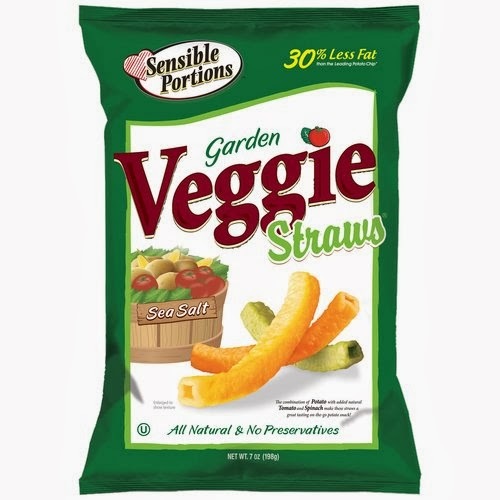 Perfect low-calorie snack that satisfies like the crunch of a chip! Getting in shape goes hand in hand with eating right ! For 3 weeks I cut processed sugar out totally and ate tiny portions. After those 3 weeks I ate small portions and made smart choices. If I wanted a cookie, I had a cookie. Not 10, but 1. If you keep saying no to that 1 cookie, all you will think about is that 1 cookie.. and end up eating 10 cookies. I also tried to substitute juice with water. This keeps you hydrated, but keeps unnecessary calories out of your body. Eat 3 meals a day and small snacks throughout the day. I hate when I hear someone say "I don't eat breakfast" People please, your body needs nourishment. Most of my lunches consisted of water, salad, yogurt and veggie chips. Keep track of your progress. I like to try on a pair of pants that are 'a little' tight and re-try them on every 3-4 weeks. Workout 4-6 times a week for 30-70 minutes. Yes getting in shape and having a great looking body takes time and dedication. Weigh in once a week (same time every time, morning or night) on the same scale (remember clothes add a little, but not much). Weight is a motivating factor, but don't get mad if you aren't losing 2 pounds every week. Keep a log of when you workout. I kept a little notebook to keep me motivated. When I looked at it, I either thought "great job, go me!" or "wow, I haven't worked out in 3 days, better get back to the gym!" This is also a good way to keep track of how much weight you're lifting. Don't be scared of the gym, weights and machines. If you have any questions, ask someone that works there. The last thing you want is to use something improperly and hurt yourself. Working out is a great stress reliever, once the blood gets flowing, endorphins are released and make ya' feel great! Get up and GO! I can't tell you how many times I was dreading going to the gym, but once the workout was over, I had a 'workout-high' and was proud of myself. Bring your iPod. Music is the best to work-out to! 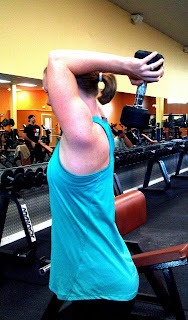 Lifting: Tricep Pull down, 2x20- 30 lbs. Bicep Curls, 2x20- 10 lbs. Lifting: Tricep Pull down, 2x20- 30 lbs., Tricep exercise with dumbbell, 2x20- 20 lbs., Bicep Curls, 2x20- 10 lbs. Bike- 20 minutes total: 10 minutes at resistance 9, 5 minutes at res. 11, 5 minutes at res. 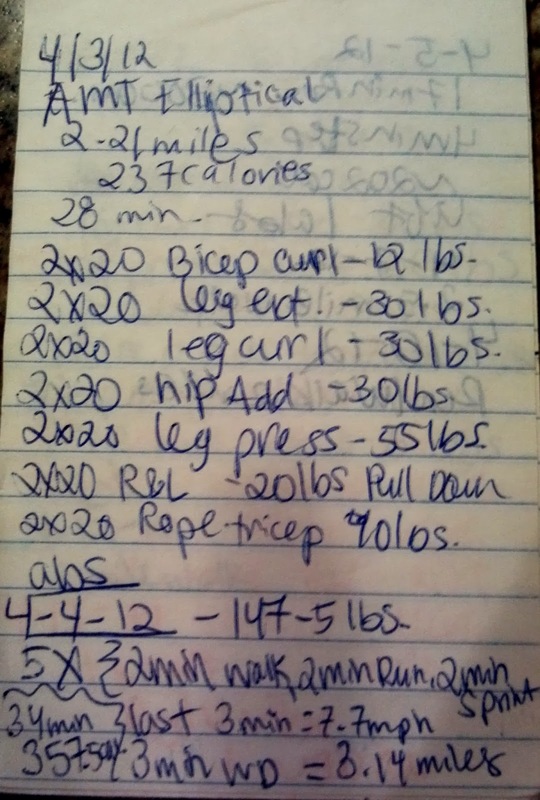 8 Lifting: Tricep Pull down, 2x20- 30 lbs., Tricep exercise with dumbbell, 2x20- 20 lbs., Bicep Curls, 2x20- 10 lbs. If you are someone that does not like working out on their own, I would highly recommend these group classes.